It may well help if you are focussed on specific subjects and talk about things that you know very well. Possible subjects might include movies, books, websites, tech and computing, apps, gardening, cookery, dieting, wildlife, news, politics, video games, fitness or sport in general, such as football, golf or tennis. Will it be serious, lighthearted or extremely funny? Who will your target audience be? Knowing the answers to these questions will certainly help. 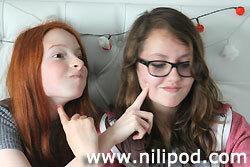 The NiliPOD has been made to appeal to a younger audience of children and teenagers, although if older listeners want to tune in as well, then the more the merrier as they say. If you are struggling to decide on suitable topics for your podcast, think about catchy titles, such as 'Ten Things That You Need To Know', and then each show could concentrate on different items, along the same theme. Alternatively, you could pitch on item against another, using a VS theme, or target the cute factor by talking about baby animals, such as kittens. Keep an eye on the news and include anything topical and relevant to your theme, and most of all, be completely honest if you are doing reviews. Are you knowledgeable or very much an amateur in your field of expertise? If you would like your audience to be engaged with your subject matter, then it may work well to get them to send you email messages that you can read out on future shows. Even better, why not consider making use of the audio recording functions of www.speakpipe.com. This popular website allows listeners to leave you actual audio messages, notifying you by email when they are ready for you to listen to. And if you are brave enough, you could even try your hand at live streaming from time to time. Podcasts: What will I be talking about?